IT ALL STARTED with the poster. On the wall at graphic designer Frans’ house in North Holland. A movieposter of Gone in Sixty Seconds, with Eleanor lively in picture and not Angelina Jolie, a correct choice. Frans had nothing with Mustangs, but in the years this poster was on the wall a passion grew that was not to be ignored. And also his wife Yvonne slowely got the Eleanor-virus. NEVER UNDERESTIMATE the pictures that impressed you at youth, these can nest in your subconsciousness and develope into a passion. So it seems to be with Frans. Here’s why: the first version of Gone in Sixty Seconds was made in 1973, and Frans watched that a couple of times. And also in this a Mustang played an important role, a Mach 1. That film was made by Toby Hálicki, who not only wrote the script, but also directed it and played a leading role. The man also took care of the stunts. The movie was about a gang that had to steel 48 vehicles for a “customer”. All the cars had been given girlsnames to misled earsdroppers. The Mustang was listed under the name of Eleanor. The film finishes with one of the longest and most spectacular pursuits ever filmed, where Eleanor makes a jump of dozens of meters. It took more than seven months to get that part of the movie well on the celluloid and it seems 93 cars were driven to scrap. A beautiful score for a regisseur/actor who started his carreer as a junkman. In spite of the fact that there where some errors in the chronology – just like in Bullit – and in spite of initially bad criticisms, the film was a success. It’s been brought out on DVD again. IT DIDN’T ENDED well with Toby. At the making of a continuation movie, Gone in Sixty Seconds II – The Slicer, he planned a scene in which a watertower should fall. To make this happen at the correct moment, one of the steel legs on which the water tank stood was cut. Unfortunately the watertower collapsed to soon and fell exactly on… Toby Halicki. A continuation has come eventual, at least a remake, under control of Jerry Bruckheimer (also responsible for top gun) and with Nicolas Cage, Angelina Jolie and of course a Mustang in the lead. This time not a Mach 1, but an older Shelby GT500 (1967). Especially for this film Cinema Vehicle Services developed a bodykit to give the car enough attitude to put it above the Porsches, Ferrari’s and Lamborghini’s. This adjusted Eleanor had such an impact that it has been reconstructed several times in the U.S. Not on the basis of an original GT500 (that would be a sin, because those are collectors items), but with an ordinary Mustang as a donor. A Mustangdealer in Texas has made it into a business. He took over the prints from Cinema Vehicle Services and started to make the bodykit in serial. Under the blessing of Carroll Shelby, the dealer will even (in association with cobra builder Unique performance) produce a serie of 400 ready-to-rumble Eleanors. FRANS WAS ONE of the first to visit the remake of Gone in Sixty Seconds and after several years of staring at the poster he made up his mind. He is a car-enthusiast (drove a Porsche 928, Nissan 200SX and Mitsubishi 3000 GT VR4) and decided to put everything aside for his very own Eleanor. I sold my Mitsubishi, from then bicycled to the office and searched the internet for months. In November 2004 I found a real nice Eleanor on Ebay. A really serious candidate. The owner even had a website on which i could see how the car was developed in his task. After looking at the more than hundred pictures i was convinced, this one i had to have. I immediately pressed the Buy It Now button. Not a moment to soon so it appeared, because there were already far-reaching negotiations with someone in New York. The car was on Ebay for only eleven hours. On February 14 2005 the Mustang was delivered at Frans’ home in a container. He removed the sealing and there she was: Eleanor. “without a scratch, a little dusty, but even more beautiful than in the movie”, said Frans. 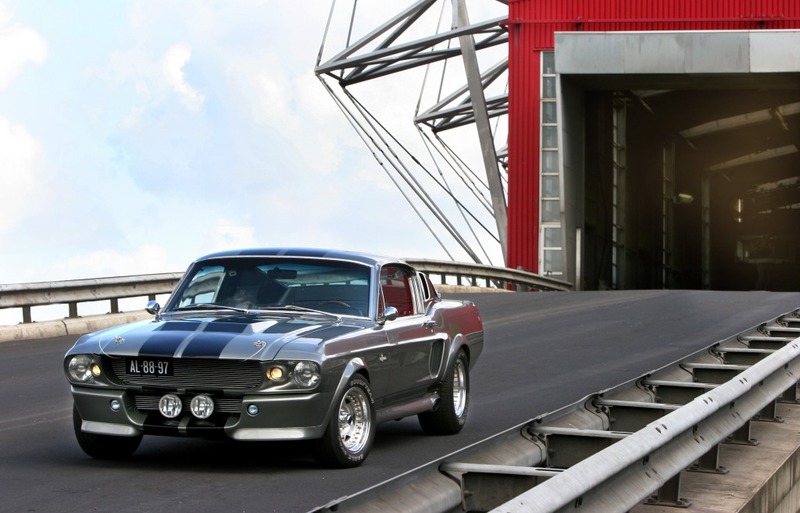 On April 12 the GT500 was approved by the Dutch RDW and with that the first Eleanor in Holland was street-legal. TIME FOR A RIDE with the beast, which looks mighty impressive due to the big bult on the hood, under which is a Holley-carburator as large as a camping cooker. This warrior-appearance is also being contributed by the new frontbumper, with an extra grille and two modern, small lights. Visual appearances are reinforced by the two extra lamps in the nose, the sideskirts, the sidepipes and the spoiler on the reardeck, all elements of the Eleanor bodykit. Under the hood there’s not the 428 V8 that belonged to the original GT500, but a 351 Cleveland, with which the 355 HP which where initially provided by the GT500 effortlessly is exceeded. At present a 500 HP should be at hand, but Frans want’s to install NOS, so that he can incidentally call an explosion of 800 HP. In the movie Eleanor also got NOS, but not for real. It’s only for appearances. The car has got, however, a push button on the acceleration poke with the text Go-Baby-Go to activate the NOS. I already got that one, the rest is approaching. At the moviecar the sidepipes too where only for appearances, at my Eleanor they are however the real thing. They make a serious sound too. Not warmly and dark brown, but hard and aggressive, like a NASCAR. It makes the hairs in the back of your neck spontaniously jump into line, very beautiful therefore. Although it could be a little tireding at the long run, unless you really love the sound of anti-aircraft guns. THE PREVIOUS OWNER used its Eleanor for drag-events. Thats been proven by the clutch, the heaviest I have ever felt since the Lamborghini LM002. Extra difficulty is that it seizes all the way at the top, as a result of which you almost must lift your foot of the floor at driving away. Its difficult to dose so i it took me a couple of kilometres to drive it fluently. The interieur is standard Mustang, with some additives. Such as an enormous tachmeter on the steeringcolumn and two red buttons on the middleconsole: to awake (still to assemble) the NOS and to activate an extra fuelpump. Those are, as it happens, very necessary to obtain the maximum from the NOS. The steering is a little vage. That is not typical Mustang, but typical for an American classic with this kind of steering. I’m about to change that too; says Frans. There is a lot of stuff out there for Mustangs and that includes rack and pinion steering. With that she will handle better and also be more responsive. She will go from four rotations to three. IN SPITE OF THE FACT the engine is enormous (approximately 5.8 litre), it’s a little cammy, this means: it must make a certain number of revs to really produce power. Below that, it somewhat rumbles and it takes some time to get the pace. But then it goes. I don’t want to hurt Frans’ love, therefore no burn-outs and all, but i may put the pedal to the metal once the machine rolls. The anti-aircraft guns increase in volume and frequency dramatically as the Mustang goes, with the intimidating unstoppability of a supertanker. Due to the hood with the bult and the enormous mouth filled with gauze, it looks somewhat like a prehistoric monster on the attack. Eleanor doesn’t feel superfast, a feeling which I recognise for example from a Viper. That’s because all the strenght is at hand constantly, without a sensational peak. As a result, you don’t feel the kick in your back, but the constant, insisting push of a fictitious giant hand. How fast you’re really going, you can see at the pace the Mustang pulls in the other traffic, from which more than regular a thumbs up is to be seen. That kick in the back wiil be there soon, when the NOS is installed. Then all Frans has to do to get launched with 300 HP extra, is push the red Go-Baby-Go button on the shifter. AT THIS MOMENT the transmission is fairly short: at 70 miles per hour (115 kmph) the tach-counter indicates 2900 revs. At an engine with this capacity it is possible to lower that. Frans intends to do that too; instead of a drag-transmission he wants it a bit more racy. Eleanor brakes considerably well for a car from the sixties and it’s fairly easy to make it even better. There are still a lot of parts being manufactured for Mustang motorsports. You will have to apply some muscle strength to operate the brakes, but this is normal for a potent American from that time: except for the steering all the controls feel like driving a truck. As for the behaviour, you don’t want Eleanor to suprise you. As long as you can see the line it is possible to do some high speed cornering, you will be aware of the weight in front. But it doesn’t understeer. Instinctively you know that, once this animal unexpected comes in over- or understeer, you will be out of rescue options at the blink of an eye. As a result, you will even more respect the guys who provided the stunt work in Gone in Sixty Seconds. Those are heroes. Suspension, at present, still allows relatively much movement of the bodywork. Also that is something Frans wants to improve, what undoubtedly will lead to more feeling of control. HE HAS PLANS STILL MORE: a dashboard and door panels of brushed aluminium and wheels of a ford GT40, with knock-off spinners please. “about those wheels, i’m not certain, because i also like the current Centerlines”, so he says, an opinion i entirely share with Frans. Frans makes use of the services of Katella Classics (of peter Onken, a man with experience in dragracing) in Beverwijk, to get Eleanor into a state of true perfection. Frans is not planning on keeping Eleanor all to himself in everyway. He wants to take his beauty to shows and all. He who wants to see her with his own eyes, put down September 3 and 4 (2005!) in your agenda. Then the first Dutch Shelby GT500 Eleanor comes to Palace ‘t Loo in Apeldoorn, as one of the stars of “AutoVisie 50 years” jubilee-exposition.